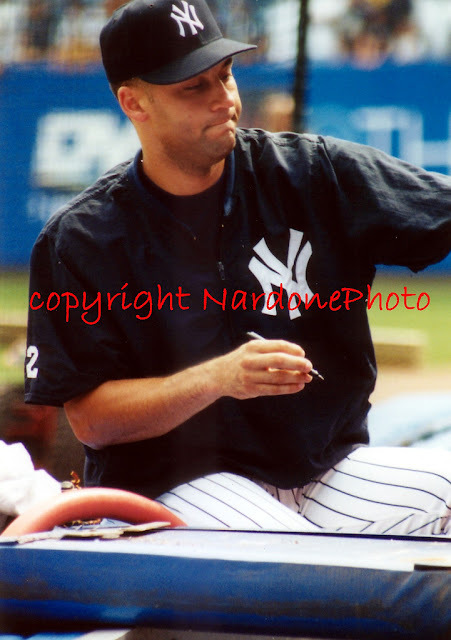 Photo Gallery Tuesday "Derek Jeter"
My photography obsession actually started with sports photography. I attended the US Open tennis every year since 1994, and many Yankees games where I loved shooting the players. I was actually lucky enough to obtain seats at the Yankees games right over the dugout, which made for some great opportunities. The Yankees are quite a classic sports team, and I love the old vintage players as well like Babe Ruth. This photo of Derek Jeter was being in the right place at the right time. He decided to sit up on the dugout to sign autographs for fans. Photography has alot to do with being in the right spot when something happens. I have yet to visit the new stadium, seems just too big to me, but maybe one of these days I will venture back to the Bronx. Good morning Rosemary! I LOVE the Yankees and, of course, Derek. We go to one game every season. I have been to the new stadium and it is incredible - yes, it is big but in a wonderful way. I am waiting until later in the season so I can see the gorgeous and talented Jete back in action! not a sports fan at all ... but i admire your photo and your being in the right spot at the right time! Derek can make you a baseball fan, no doubt indeed! !